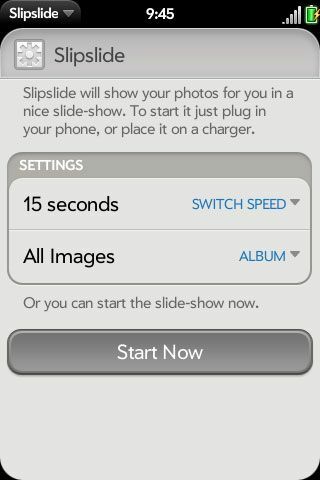 Slipslide is a nifty slide-show program. Turn your Pre into a digital photo frame... albeit a very small one. All you have to do pick an album, and drop your Pre on the touchstone charger, and away it goes with a dozen or so nifty transitions between the pictures. You can choose how often the images switch and what set of images you would like to see. Just Added! The newest version now stays active on both the touchstone and the USB cable. Made the images take up the whole screen and hide the status bars at the top and bottom. It is an optional feature that can be turned off if you want to see the time.